Witness says she watched plane "just take a nosedive"
(CNN) -- Children were among the victims of a plane crash that killed as many as 17 people Sunday in Butte, Montana, according to authorities in Oroville, California, where the aircraft stopped for fuel. 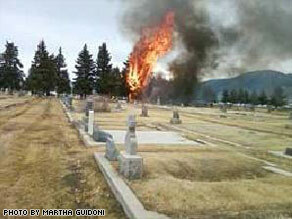 Martha Guidoni said this photo was taken after she and her husband saw the plane "nosedive" in Butte, Montana. The single-engine plane stopped at the Oroville airport at about 11 a.m. PT, refueled and departed about half an hour later, Police Chief Kirk Trostle said. "There were some adults and children on board," he told reporters Sunday evening, adding the passengers got out briefly to stretch while the pilot refueled the plane. Federal Aviation Administration spokesman Mike Fergus said based on preliminary reports, 17 people died in the crash. The Pilatus PC-12 was headed to Bozeman, Montana, but rerouted to Butte instead and crashed 500 feet short of the runway at Butte's Bert Mooney Airport, Fergus said. The flight plan originated in Redlands, California, according to flight-tracking site FBOweb.com. Stops were made in Vacaville, California, then Oroville, before the plane headed for Montana. Preliminary information indicates the pilot did not declare an emergency aboard the plane before the crash, Fergus said. The National Transportation Safety Board is sending an investigation team to the scene, Kristi Dunks, an aerosafety investigator with the agency, told reporters in Butte on Sunday evening. Dunks said the plane crashed at the Holy Cross Cemetery, located just south of the airport's Runway 3. She said there were no survivors, though she wouldn't confirm the number of people on board the plane. No one on the ground was injured, Sheriff John Walsh said. Eric Teitelman, Oroville's director of community development and public works, said the small airport has no control tower but because it has a "wide-open runway" and a self-service fuel system, it is a frequent stop for private aircraft. Teitelman said at least one person -- an aircraft owner doing servicing work -- was at the airport Sunday when the Pilatus stopped for refueling. The aircraft owner "met the pilot, saw the children running around," Teitelman said. The plane, manufactured in 2001, was registered to Eagle Cap Leasing in Enterprise, Oregon, according to the FAA. "We were just taking a ride, and all of a sudden, we watched this plane just take a nosedive," she told CNN. "We drove into the cemetery to see if there was any way my husband could help someone, and we were too late. There was nothing to help." "I looked ... to see if I could see anybody I could pull out or anything, but there wasn't anything there, I couldn't see anything," he told CNN. "Some luggage [was] strewn around. ... [There were] some plane parts."